All food served in the restaurant is cooked for you by Bengt. The ingredients are selected and prepard with care and attention to detail. Here there are no printed menus, you are treated to the best kitchen has to offer each day. The food is home made, naturally with your eventual requests in mind. You should not be surprised to smell freschly baked bread when you come down for breakfast. Bengt likes to do something special for his guests. 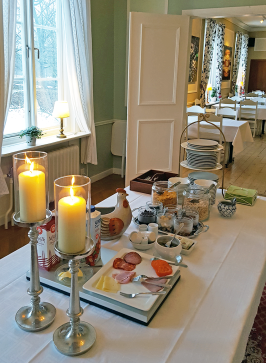 The tempting breakfast table offers many locally produced products like, Solvarbo ham, Gustafs sausage, Skedvi bread, eggs from Långshyttan and our own moose sausage as well as many other dishes. you are welcome to gather in our dining rooms for a delicious dinner. The dining rooms together - the large and the small dining room as well as the lounge may seat up to 120 dining guests. The Chrismas Buffet Table at Långshyttans Brukshotell is very popular during the Christmas season. It is classical smorgasbord with tasty homemde dishes using local produce in a traditional setting. We serve dinner and lunch for groups of 10 guests or more. Reservations one day in addvance is required.. 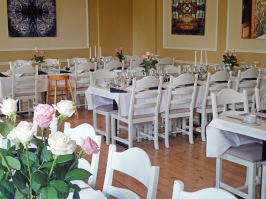 The main dining room is used for larger parties, weddings and other celebrations. It is also suitable for business and conference lunches. 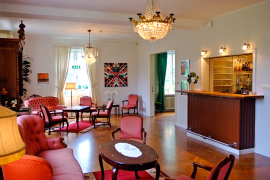 The lounge with it´s traditional furniture is a perfect place for coffee after lunch and for socializing by the bar. A bigger celebrations it is cleared to make room for dancing. The breakfast buffee contains local products such as Solvarbo ham, Skedvi bread, egg from Långshyttan and home maid moose sausage. A very charming hotel, very comfortable and cozy, a warm welcome and a cuisine worthy of a Michelin-starred restaurant, quality bedding and spacious room, - I can´t imagine not returning during a visit to the region! I hope to come back as soon as possible in your hotel, don`t change anything: it was perfect. Amazingly tasty and well prepared food in the fine dining rooms with incredibly friendly staff. The Christmas table is strongly recommended. Well stocked with everything from classical dishes to bacon wrapped moules and homemaide moos sausages!